Halloween. Most people think little further than the strange custom of having their children wear masks and go out trick or treating in the hope of getting some candy. An unexplained event of terrifying horror in 1963 however, would change the sleepy little town of Haddonfield forever. Whilst the town would still celebrate the festival of Halloween, Doctor Sam Loomis knew that it was only a matter of time before the shape of terror which formed itself back in 1963 would return. Thus, it is time to unveil a portrait of terror which will haunt you forever. 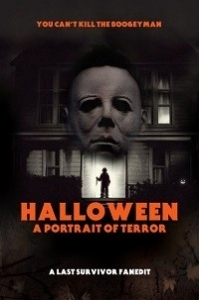 Halloween: A Portrait of Terror attempts to tell the story of Laurie Strode and her plight for survival against the seemingly unstoppable evil that is Michael Myers, aka "The Shape", over a period of 20 years. The intention is also to try and emphasize the mysterious nature of Michael by holding back any detailed shots of him until well into the first film. The hope is that you will think of Myers more as "The Shape" than ever before. A previously ordinary boy, transformed by something ancient into a pure representation of evil.... a shape of terror. Happy Halloween! Music from Dynatron's album "Aeternus"
Music from John Carpenter's album "Lost Themes"
Sophie Welch, Nadia Quarcoopome, BionicBob, DwightFry and anyone who followed the "In the Works" thread on this site. - New pre-credit sequence constructed, incorporating H20 and Halloween to tell the back story of Michael Myers. - New Title sequence created. 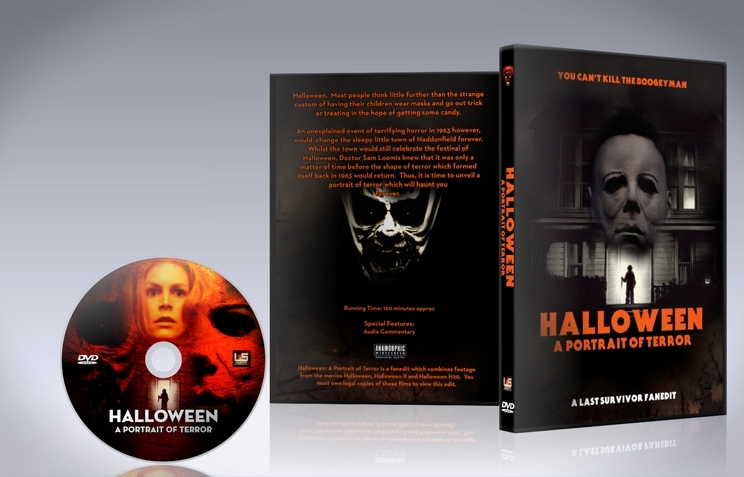 - Many scenes re-scored in an attempt to make the transition from Halloween II to H20 less jarring - utilising music from all the "classic series" Halloween films, plus music from a couple of other sources. - Sound replacement carried out for numerous scenes, including complete sound replacement during the finale of H20 where Laurie drives off with Michael's body, allowing different music to be used. - Any shots of Michael in Halloween are truncated to make him a more mysterious presence, holding back any detailed shots until the finale begins. - Halloween II drastically recut to keep the emphasis on Laurie's character, meaning many kill scenes featuring unnecessary characters are removed. - Colour correction on H20 to try to boost the contrast and take away the softer element which the picture has. - H20 truncated, again to try and keep the emphasis on Laurie as much as possible. - New end credits created. Another great work of LastSurvivor! I think the cuts made to H1 and H2 to join them are great... But I don´t know, for me H20 felt out of place... I´d rather prefer to see only a H1+H2 fanedit (I hope LasTSurvivor do it someday). I believe that the scene of Michael on fire (from the end of H2) could be cut and let us to see only the explosion. So we could think that he managed to escape somehow. Seeing him on fire raises a lot of questions. But in the end I liked this fanedit was very enjoyable! WARNING! There are SPOILERS in this review!!! In the films he is credited as "The Shape", but to me, he will always be the one and only original Boogeyman! I was nine when I first saw the televised version of the original Halloween, and for me, it literally was, to borrow a phrase from Doctor Who, a watching from behind the sofa event. Too terrified to leave and even more terrified to stop watching. The movie burned itself into my imagination and I still consider it one of the best horror films ever made. I have watched it (and it myriad of sequels) many times over the years, and with each new viewing I appreciate more and more the craftsmanship and Hitchcockian stylings of the original. This movie may have launched the slasher film craze, but this original first movie is so much more than that. It is a brilliantly constructed thriller that taps into something very primal and powerful. After Star Wars, I think Halloween may be one of the most fan edited films over the years on this site, proving that this low budget monster movie has a dark magic that still resonates with viewers. I have watched many different Halloween edits, many good, some not so great, but this newest creation by Last Survivor is by far the most ambitious and epic Halloween cut I have had the pleasure of watching. Technically, there is nothing negative to say. The dvd picture quality looked appropriate for 3 separate films of varying years. LS did some colour grading to try to soften and blend the transition from the very 70s cinematography of the H1 and H2 to the more stylish H20, and he did a good job but you just can't not escape the obviousness that H20 is a very different film. But one must go into an edit like this expecting and accepting of this fact. I did not find it distracting because the narrative editing is so strong and compelling. The audio work is pure genius and mind boggling. The amount of music replacement and audio rebuilding that went into this project is staggering! And seamless!!! Honestly, I have seen H1 and H2 dozens of times, but there are scenes so well done with such perfect new music choices, that I did not realize the music was different until the scene was almost over or until I listened to LS's commentary and he pointed out the change! BRAVO!!! This edit, if nothing else, is an example to both experienced and fledging fan editors of what can be accomplished with lots of patience, practice and talent. It is truly inspiring. The narrative editing of combining 3 movies (each with a very different style and tone) into one single storyline is exceptionally well executed. Each movie is boiled down to most essential elements, with the central driving focus on Laurie Strobe and Dr. Loomis, and to a lesser extant some of the extended cast where continuity dictates. The movie opens with a prologue set in H20 with Nurse Chambers which then flashes back into a flashback within another flashback. It sounds convoluted, but it works surprisingly well and keeps the audience smartly engaged as the necessary exposition is dumped so the fright train can get rolling. My only minor nitpick I had was this type of opening led me to expect more flashbacks or forwards, though this expectation quickly vanished once the story got rolling and I was once again drawn into the dark streets of Haddonfield. LS created an all new opening title sequence using some very stark and powerful seasonal imagery that I absolutely loved. H1 is perfectly cut down. I know LS expressed some continuity concerns that exist in the dialogue, and while Laurie's discussion about seeing someone in the backyard did stand out a bit to me too, the other piece about Annie being locked in the laundry room did not even bother me as Annie is such a drama queen, it easy to believe she got locked in a room while off camera...lol. The transition dream from H1/H2 to Halloween20 was clever and worked really well for me. Since I hate with studios do relaunches that ignore previous installments/continuity I really enjoyed LS's nod and wink to the now lost chapters of the Halloween franchise. Though this does bring one cut that really bothered me; the reducing of Nurse Chambers death to few seconds as part of Laurie's dream sequence. The way this edit is constructed with Chambers as the opening introductory character, along with her prominent role in H20, not to mention being Loomis proxy for H20, I really believe her death should have somehow been fully featured to give her character closure. The rest of H20 is very nicely trimmed down, though I too thought the rest stop kill could have been removed and seeing Charlie's death was completely unnecessary. I also wish somehow Loomis could have been worked into the H20 portions ..... just to help make the last third feel more connected and acknowledge his importance to this franchise....either a brief flashback, or maybe some sort of closing voice over (Pleasance has some incredible monologues in H4-6 that might have been appropriate). But again, this is minor nitpicking. Everything else is wonderfully crafted, especially and thankfully most, if not all, the Scream-style/self aware references have been removed, especially LL Cool J. In the end, an incredible edit by an editor at the top of his game. There is nothing more I can say except if you are a Halloween fan, this a MUST WATCH! Fantastic work! I watched this one on Halloween night with the family late at night in the dark, which is the way to watch this one. This edit is pretty much technically flawless; nothing stood out to me at all. Everything went together seamlessly. I like the H20 material as a coda but my one gripe would be it's a bit too long. Not the edit as a whole as I'm definitely fine with this length. Regardless, this is going up on my shelf alongside these movies as a thoroughly entertaining alternate viewing experience. Great job, well-executed, highly recommended! This fanedit is very good and delivers what it's supposed to be: the complete Story of Laurie Strode presented in a single movie. - The technical part is a total success. Music and pictures continuity is pretty much the same all along the edit. You still feel some music from the H20 movie is different in tone than the music from the "past" movies, but it works. Times has passed, so it's not jarring to have some differences in tone. But "sound quality wise" I never told myself "oh oh, there's something strange here". Nope, everything is constant. - The visual editing is very good too. From the opening sequence that introduces the present day along with some key elements for the audience to understand what is at stake to the transition between the 3 movies. Everything worked. The opening sequence was particulary interesting to me because A: it's edited in a manner that it felt like I was reading a book. I don't know how to explain it, it's just what I felt. AND B: it lets the faneditor free to leave behind those explanations and not cut the story of Laurie with exposition scenes that would slow the pace. The directing of the H20 movie felt pretty different from the directing of the past movies but there's not much things one can do to change this. - When you have two movies that basicaly tell one story followed by the third movie sets 20 years later for the conclusion: you feel the conclusion is "an addition". No matter how good the transition is done. The only way to work around that is to make your fanedit go back and forth from present day to past at some points to make the whole thing more homogeneous. But Last Survivor's goal for the edit is to tell the story more or less chronologicaly (except for the opening sequence) and it is understandable. Cutting from one time to another would slow the pace and remove a lot of tension, and for a movie like Halloween it would not have been smart. So I think Last Survivor took the wright approach. It's just that after the opening sequence I was set for an edit that would mix the time period at least 1 or 2 points along the way. - The lenght. I know, 2h40 for a "3 movies in 1" edit is a success. I applaud Last Survivor for that. But I can't help feeling it's still 15 minutes too long for me. I'd be interested to know why Last Survivor let the scene from H20 with the mother and the girl in the toilet for example. I'm not sure it is needed because it shows that Myers is really back before Laurie knows. I would have let the audience wondering if Laurie is really in danger or not and just have to deal with her mental problems. (but maybe it would have been too much time without a scary scene? Maybe that's why it is used here?). Anyway, just thinking out loud. - Laurie knowing about Myers being her brother is done in an understandable way (she remembers during her sleep, as far as I understood. Or maybe she always knew, it's just that the audience undertands it now? ), but it is still a bit too subtle, IMO. because when later she speaks and says "Michael" I told myself "Wait, she knows his name?" and "Oh yes, she remembered him in that dream." So, it works on a storytelling level but I was still doubtful about something for a second. Or maybe it's just me. As you see, even the nitpicks I have I understand them. 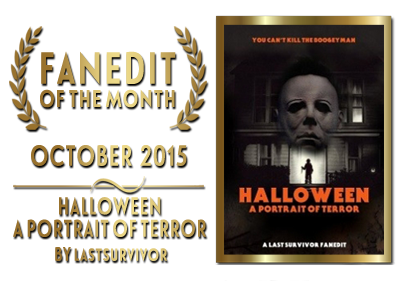 I had a real pleasure waching the complete Laurie Strode story in the best possible way, thanks to Last Survivor. One of the best faneditors around. Thanks for the review TMBTM... much appreciated as always. That scene with the mother and the girl from H20, well I have to say I kept changing my mind about whether to include it. It does go against my intention of only really having important characters in this, but I let the fact that I genuinely like that scene a lot win out in the end. I think it's so creepy when she just sees Michael through the crack in the toilet door, I just couldn't help but keep it in. However, I concede that it's not necessary and the scene could easily go. Might even be better without it. Another great LastSurvivor fanedit! As is usual, the editing is flawless and the A/V quality is excellent. Narratively this was very well done. Connecting H1 and H2 was perfectly done and that felt like a natural storyline. I was very impressed with the opening sequence and the segue to H20. The only negative in the narrative is just simply that H20 feels a bit tacked on, it can't help but feel like a separate story. But that didn't really bring things down too much and I enjoyed the hell out of this. I'm sure I'll listen to the commentary track in the next few days, if I remember to I'll update my review. Highly recommended for Halloween fans!